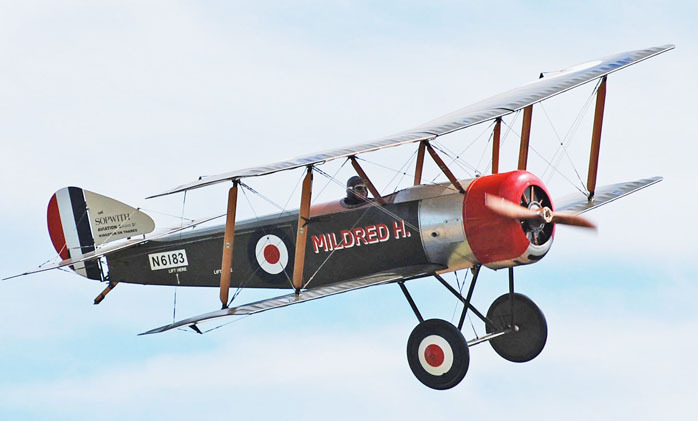 Country: Great Britain Wingspan: 26' - 6"
Year: 1916 replica Length: 19' - 4""
The Sopwith Pup was developed into a military fighter from a little runabout airplane named the Sparrow developed for Harry Hawker to use as a personal and “business airplane”. The Military development was Powered by an 80 HP LeRhone 9C Rotary engine, and armed with a single Vickers .303 machine gun firing through the propeller using a Kauper interrupter gear to prevent the gun from shooting out the propeller. The name “Pup” came from one British Colonel Brancker whose exact words to Harry Hawker were, “Good God it looks as if your 1 and 1/2 strutter has had a Pup” Our version of the Pup is constructed from original drawings and the Replicraft plans, but differing from the wood of the original, the fuselage has been built up from steel tube for ease of construction. While accurate in outline and overall construction of the wings and tails, for ease of maintenance and safety our airplane is powered with a Modern Lycoming O-320.